Happy Saturday everyone.. It's time for our Monthly Feature Day at Your Next Stamp! This month the Design Team are creating cards with their favorite techniques. My favorite technique is anything with Distress inks! I used some Picked raspberry to create a bold background on a piece of Watercolor paper. Then I die cut it with the Stitched Rectangle Die set. I adhered the panel to a White card base. 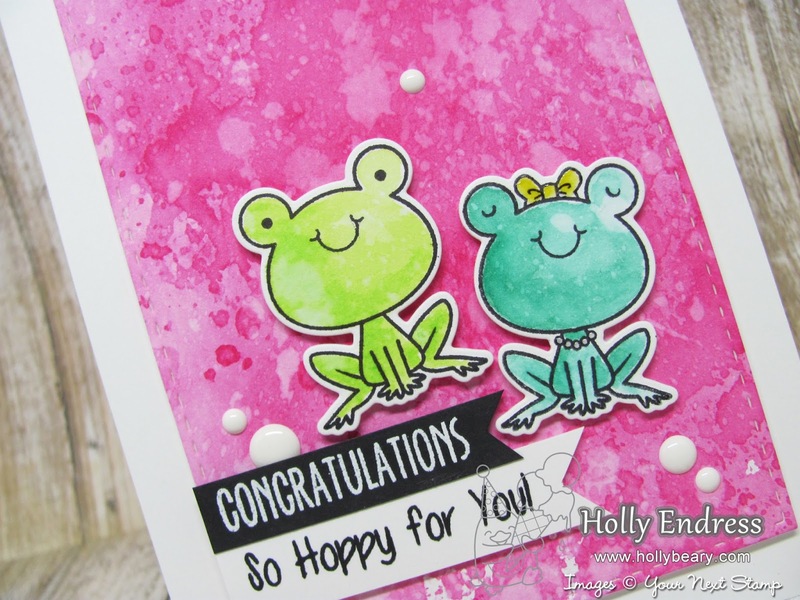 Then I stamped the images from Froggie Love onto some Watercolor paper and colored them in with Distress Ink and spritzed some water onto them and lifted it with a towel for more distressing. I adhered the images to the card front with some foam tape. There's also some Glossy Accents on the necklace and bow. Then I stamped the sentiments onto some card stock and trimmed the ends into banners and adhered them with foam tape as well. For a pop of the White I added some White sugar gumdrops. Be sure to head over to the YNS Blog for more great projects and a chance to WIN a Stamp set of your choice! Awww, so cute Holly, the sentiment is sweet! These frogs are so adorable! Love this card!